* Amber Oud starts off with- surprise.. amber. It’s a masculine amber, not powdery at all. * Projection is quite strong, you will be noticed wearing it. * After about an hour, the oud starts to enter the scene. It’s not aggressive or animalic, but more of a spicy wood with a bit of musk. * The amber oud blend lasts more than 24 hours on your skin – pretty much staying the same after the first hour. It’s quite amazing how a mall store can sell a bottle for $10 that smells better than most of the oud fragrances out there. The bottle says Amber Oud and that is exactly what you get. This is coming from someone who loved (and bought) By Killian Rose Oud and almost bought their Incense Oud but thought their Amber Oud was a misnamed joke. If they would have put the Body Shop Amber Oud in their expensive bottle, it would have been 300X better to what they had. Unfortunately, Amber Oud was only available in Arab countries, but is widely available through eBay in the UK. I bought it online had it shipped over – receiving a full bottle and the deodorant for under $20. That makes it probably the best blind buy/cheapie in my collection . Strongly recommended. 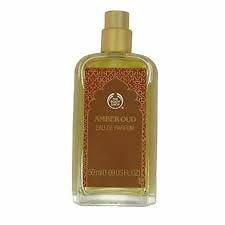 Body Shop Amber Oud is no longer in production and the best place to find it is on Ebay from UK sellers. Disclaimer: No disclaimer needed as I own a bottle. Image courtesy of eBay. I agree Body Shop is ‘what you see you actually get”, good – right on point! I mean, personally I always liked them- and being English was brought up with BS (did I just say BS?!?!?). OK, just saying, agreed. Yep, highly recommended. It’s an awesome amber-oud regardless of price! This sounds delightful! Too bad I live in the US. I have 2 for sale.